Recently renamed Africa Fashion & Art Week, the series of events formerly known as Africa Fashion Week LA have brought an electric vibrancy to the Los Angeles Fashion Week continuum. In the process, they’ve promoted emerging talent while reinforcing what so many fashion enthusiasts have long known: the African continent is home to some of the world’s most exciting textile and color combinations, and continues to inspire designers on a truly global scale. Q: What is the history behind Africa Fashion & Art Week? When & how did it come about? Africa Fashion & Art Week began in 2011, as Africa Fashion Week Los Angeles, when Nnenna Obioha and Onyinyechi Egeonuigwe sought to create a platform for emerging and established African talent in Los Angeles. In 2013, we partnered with the Papillion Institute of Art and have expanded our annual event to include artists as well as designers. The event is now called Africa Fashion & Art Week. Q: What sets Africa Fashion & Art Week apart? Is there a “vision” or perhaps a mission? 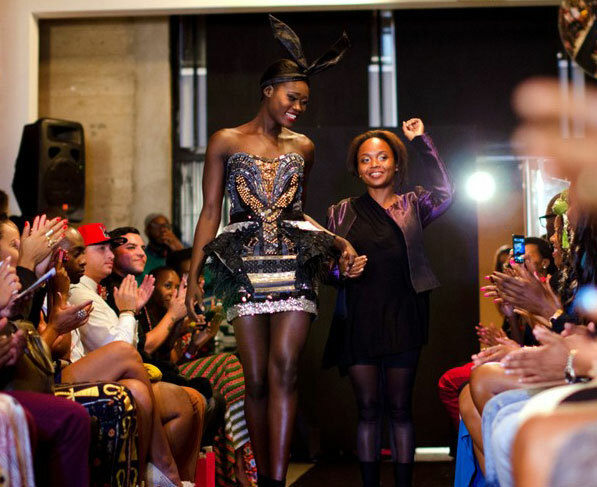 Africa Fashion & Art Week brings some diversity to LA Fashion Week. Our designers offer a very unique and appealing perspective on fashion trends that need to be showcased. Our vision has always been to support and promote dynamic African talent and to help designers and artists grow their businesses. Since the departure of IMG, various local producers have stepped up to keep LA Fashion Week alive. We’ve seen a tremendous amount of growth in the past several years with LA Fashion Week offering a multitude of unique shows. It sets LA apart and we look forward to seeing continued growth. It’s hard to say where fashion week can go in the next few years as it’s continuously changing, growing and evolving. However, I think it might be nice to see some type of unification between some of the shows; some partnerships between the different producers could be essential in the future. Our greatest challenge is financing. People have loved the idea of Africa Fashion & Art Week from its conception; however, it’s been difficult producing the show on the level we want without outside financial backing. Difficult, but not impossible. This is our baby and we love this event / project so much that we strive for continuous growth each year. The uniqueness comes from the independent shows that make up LA Fashion Week. There is no central show. This is the strength of LA Fashion Week but it can also be its weakness. We definitely think it’s a good thing. Corporate partnerships / sponsorship allows the producers of these shows to gain the financial backing necessary to execute the show properly, and to also market these shows in such a way to attain a larger audience. What we enjoy most is the audience’s reaction to our show. That is our biggest motivation. We love how excited they get to see all the elements of the show. We also love giving African designers and models a necessary platform to pursue their passions. Onyinyechi – My favorite city is Los Angeles; I love it here. We have warm weather, lovely beaches and beautiful people. I love lots of different colors but my favorites are black and pink. Black looks good all year round, and pink is such a fun and flirty color. My favorite accessory is my smile, because it will never go out of style.